Caribou's collection rates are factored by its operational costs. The weight of your trash has a huge impact on YOUR rates. Waste is disposed of at landfills that charge us by weight. The national average per household is 45lbs per week. "WHEN IN DOUBT OF AN ITEM YOU WISH TO DISCARD , PLEASE CONTACT US." Please empty all liquids from containers before discarding. Please use trash bags and properly tie them closed. Vacuum cleaner dust / debris MUST be in sealed trash bags. We do not wear respirators. Pet waste or cat litter MUST be disposed of in heavy, thicker bags to ensure no ripping. This material is very heavy and depending on weight could be subject to additional fees. Please let us know up front of animal waste. Caribou collects "normal" residential, municipal, and commercial solid waste. The "normal" solid waste consists of general kitchen waste, household contents such as clothing, packaging materials, junk mail etc... household materials. Bulky items such as furniture can be collected, but need to be scheduled and additional charges may apply. 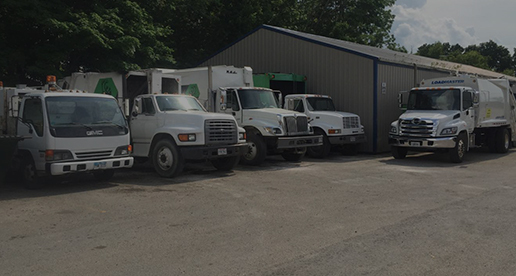 We do not accept construction / demolition materials, hazardous materials, flammable liquids, liquid paint, tires, batteries, or any ridged items exceeding 3' in length such as lumber or fence posts as they are safety concerns with the hydraulic packing mechanisms on our trucks. Commercially we set rear load steel dumpsters that will accept some larger materials and quantities. Materials should not measure more than 3' in length such as pallets, lumber, or metal objects. Dumpsters are mainly for larger quantity needs for our customers and NOT construction dumpsters. We do not accept food grease, liquid paints or flammables, batteries, tires, and compost materials in our rear load dumpsters. If there is a need for construction containers we have several open-top roll-off dumpsters for the large items that can not be compacted in a rear load garbage truck.